Dean Harrison was born and raised in the Seattle, WA area. He is the Uncle of one of our wonderful volunteers. 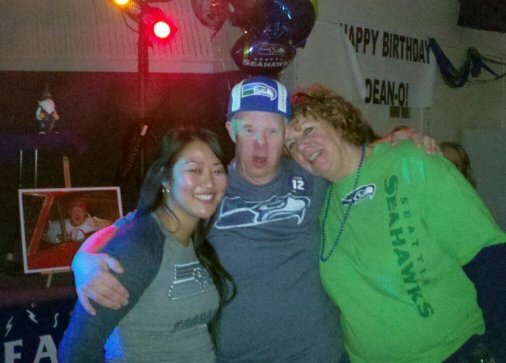 This past January Dean celebrated his 60th birthday with 200 of his closest friends and family. Dean is a lover of all Washington sports especially the Seattle Seahawks; his party was Seahawks themed. The Seahawks mascot “Blitz” made a special appearance at the party where he posed for some pictures and danced with the party goers. The smile on Dean’s face got bigger and bigger every time he opened a new present; Seahawks apparel, hats, accessories, etc. Posted in Uncategorized | Comments Off on Dean-o turns 60! 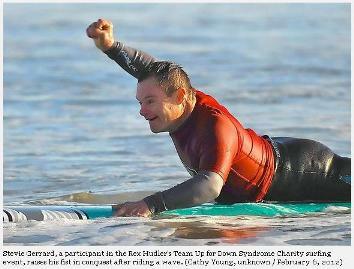 It was a beautiful day in Huntington Beach during last Friday’s “Surf’s Up” event. Check out Steve Virgin’s article, and all the great photos captured during this special day. 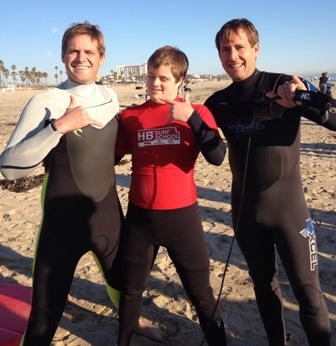 Last Friday 2/3, Team Up for Down Syndrome and the International Surfing Museum hosted “Surf’s Up for Down Syndrome“, an event that brought in professional surfers that escorted participating individuals with Down syndrome into the Huntington Beach surf and showed them how to ride the waves. The after-party was held at Sandy’s Beach Grill, where more professional athletes and special guests greeted supporters. 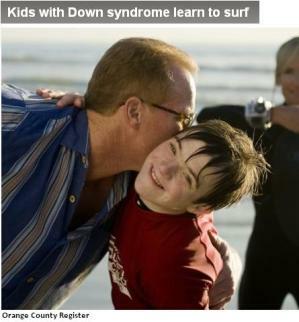 DSAOC was proud to be a recognized sponsor of this event, and was thrilled to see our Orange County families featured in the OC Register article.